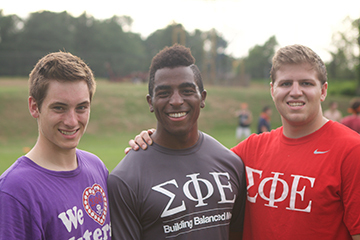 SigEp is proud to offer leadership training that enhances our undergraduates' experiences and prepares them for life after college. These programs have been recognized as among the best in the fraternity world at shaping the lives of undergraduates who will go on to impact their communities. The Balanced Man Program is designed to provide a sufficiently structure, supportive experience with a brotherhood of high achievers, close friends, and mentors to provide personal and professional guidance. Students in living-learning communities have higher overall grades, are more engaged in campus activities, and are more likely to spend their time outside of the classroom developing the life skills they need to succeed after graduation. Make the 90% of your hours at college spent outside the classroom exceptionally valuable to your growth and development. © 2019 Sigma Phi Epsilon Fraternity. All Rights Reserved.